It is freezing cold on the polar expedition. Your spit has started to freeze in your mouth, but you choose to remain outside. You must be careful. For one of you is the BEAST. You do not know who. It might even be two of you. Or more. And they are out to get you. So find out who to trust, before it is too late. 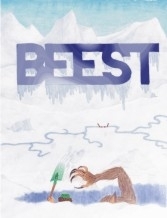 Beest is a cardgame of deep thinking and pure guesswork, which will keep three to six players busy for about 45 minutes. Beest is a strange game. At the beginning of each round, the lot determines one player who will be beest that round. His (or her) ambition is to convert all other players to beesthood before they find him out. In the meanwhile, all other players try to avoid this by trying to find other players who are not beest. If a player turns into a beest, he joins the original beest in trying to get other players converted. But only the original beest may do the actual converting. All this is done by playing cards to your opponents’ series of hiding places. As soon as a entry path is established, players exchange tokens. If both are non-beest, they get closer to winning. If one of them was beest but the other was not, the non-beest player is converted. The box of the game fills in as a non-human player. It might be the beest, and, strangely enough, it might even win the game!